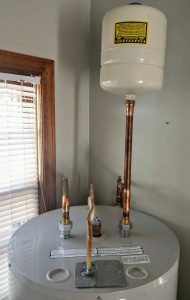 In a previous article we discussed the importance of keeping water pressure in your home at a safe level to improve the longevity of your plumbing system and everything connected to it. If you haven’t read it yet it, read it here. Having an understanding of water pressure in general will help you to understand the impact of thermal expansion. Thermal expansion is a specific phenomenon that can affect the water pressure in your home and is generally caused by your water heater. 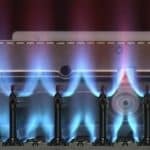 Devices designed to mitigate thermal expansion have been required by code since 2006 and are often located near the water heater, but not always. 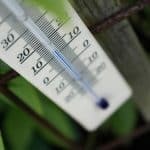 We will cover what thermal expansion is and why it occurs, how it affects plumbing system, and how to verify if your home is protected. If you still have questions give us a call or leave a comment. To sum it up in one sentence: Thermal expansion is the tendency of matter to change in volume in response to a change in temperature, through heat transfer. Thermal expansion falls under the umbrella of science known as thermodynamics and the science behind it is predictable and well understood by people much smarter than me. What I want you to know is that thermal expansion occurs all around us. Bridges, high voltage electrical lines, railroad tracks, your coffee mug, even the oceans experience the effects of thermal expansion and when the things we create don’t take it into account they can fail in catastrophic fashion. When a system is designed to handle these effects damage can be prevented. 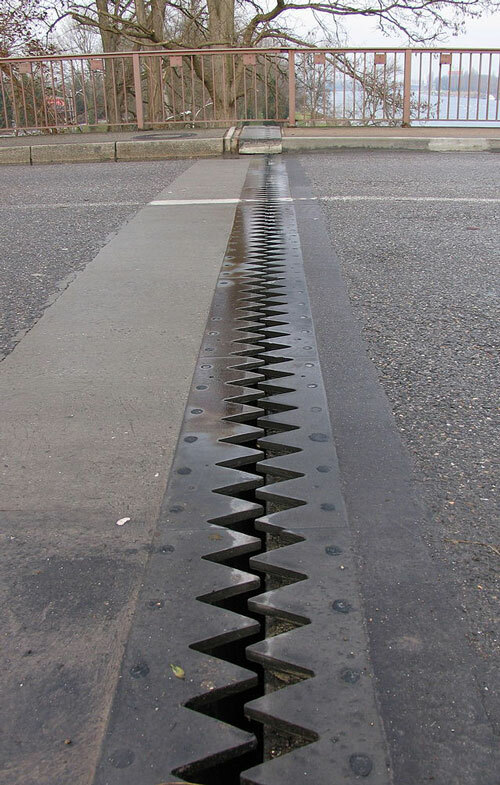 Without looking at the leafless trees we could have assumed this photo was taken in the colder months by noticing the gap in this expansion joint. 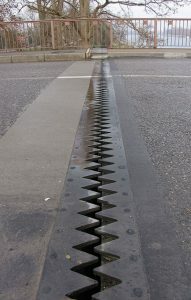 In the heat of the summer this gap in the expansion joint will be gone. Under the heat of the summer sun the roadway of a bridge is actually a few inches longer than in the cold of winter. If an engineer failed to take this thermal expansion into account when building a bridge, that bridge would buckle and collapse. Space is created to allow a road to expand and contract without damage when it is built. When we relate this to your plumbing system the heat coming from your water heater is actually a catalyst that changes the pressure of that plumbing system. Cold water takes up less volume than hot water. When your plumbing is installed properly there is a check valve just before your water meter which prevents water from going back into the water system. A check valve is actually like a trap door and only lets water flow in one direction. If water tries to go back the way it came the door shuts on it. If everything else is working properly and you have no leaks, then your plumbing is a closed system, meaning that nothing can leave or enter your pipes unless something is opened on either end. This is why your water heater can cause some trouble and raise the water pressure inside your plumbing. Water is incompressible. Unlike air, it’s impossible to squeeze any quantity of water into a smaller volume if it remains at a given temperature. But it does expand as it warms up and contracts as it cools. You can witness the most dramatic effect as water actually transforms all the way into steam and blows the lid off of a pot. Inversely we take advantage of water’s ability to contract in volume as it cools when we make canned foods. When you heat a glass jar during the canning process the water inside the food expands, forcing air out from under the lid. As things cool back down the water contracts, taking up less volume and pulling the lid down tight in the process, keeping everything nicely sealed. The same thing happens to the water inside your plumbing. When heat is introduced by your water heater the water expands, actually taking up more physical space than it did at a cooler temperature. Because your plumbing is a closed system and doesn’t get any bigger, that expansion is expressed as increased pressure within the system. Think about an inflating balloon. When you inflate a balloon out in open space it takes on a roundish shape, but if you inflate the same balloon inside a long tube it will spread out in the only direction it can, towards the open end of the tube. Your plumbing is just a long tube with different branches, only there is no open end when everything is closed shut. If you keep adding air to that balloon inside a tube, eventually the tube will rupture. The amount of thermal expansion that a water heater creates is not enough to cause your plumbing to actually burst, but it often adds enough pressure to damage the fixtures, valves, appliances, and in certain cases the piping that make up your plumbing system. I have measured increases of 80 psi in homes over just a few minutes while a water heater is actively heating. If your water pressure is already high thermal expansion could be putting your home at risk. If you notice a really fast surge of water from your faucet first thing in the morning that slows down after just a few seconds you probably just saw an effect of thermal expansion. What you witnessed was the system bleeding off the excess pressure. If you have a faucet that only drips on you occasionally, it is likely happening while the pressure peaks just after your water heater has gone through a heating cycle. We most often observe this on the temperature & pressure relief valve (commonly referred to as a T&P valve) attached to the water heater. Example of CPVC piping. It is a light creamy color that darkens towards yellow as it ages. Another common form of damage occurs to toilet fill valves. These are usually made out of plastic and the excessive pressure can warp the whole valve. The stress can cause the valve to open just a bit. The leak is likely to stop when the excess pressure is relieved, usually after enough water leaks out. I often learn that a customer has been replacing their fill valves every 1-2 years when they should last around 7-10 under normal conditions. The worst symptoms can be felt by appliances. Very high end appliances will actually cut the water flow off when excessive pressure is detected to prevent any damage. With dishwashers and washing machines on the market in the thousands of dollars it makes sense to keep them protected. I have watched customers replace $1,200 washing machines due to damage from high water pressure and the fast closing solenoid valves inside of them. If you have a newer ice maker, washing machine, or dishwasher you should manage your water pressure properly to ensure it gives you all the years of service it can provide. Polybutylene is an inferior product. It is gray thin walled piping. While similar in appearance it should no be confused with PEX. Homes with CPVC and gray polybutylene piping should be especially concerned. Polybutylene was a poor product that resulted in many class action lawsuits and is prone to unprovoked failures, while CPVC is a yellow plastic pipe that gets very brittle and is prone to cracking under high stress as it ages. By the time this piping reaches middle age, typically around 15 years it becomes very vulnerable to breakage. High pressure can exacerbate the problem by keeping the pipes under constant strain. This piping is very flexible when it is new and shoddy plumbers often curved and bent it during the installation process. When the pipe loses the initial flexibility and enters the aging brittle stage, high pressure can begin to cause stress fractures which soon become catastrophic pipe failures. This is the worst case scenario and fortunately is not as common as the other consequences of high water pressures. If you have CPVC or gray polybutylene piping you really have to be proactive and keep tabs on your pressure at least a few times a year. Testing for thermal expansion is the same as testing the regular water pressure. You need a test gauge and a place to connect it. 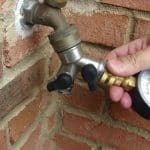 You can place the gauge on a hose bib or a laundry faucet that accepts a hose connection, but the drain connection on your water heater is ideal. Connecting to the water heater allows you to turn the water heater on while you watch the pressure climb. I recommend using a gauge with a marker needle that will allow you to leave it on for an extended period of time. This ensures you will catch thermal expansion at some point if it is occurring within your system without having to hang around and watch the needle move. If you have any questions we would be happy to walk you through this or come out and check it for you. IF YOU HAVE IT, ELIMINATE IT! There are a few ways to prevent thermal expansion. Special devices called water relief valves were commonly installed by some builders in the upstate instead of an expansion tank. These valves have a dial on them and can be set to open when pressure reaches the designated level. The installer adjusts the valve to a PSI just a little higher than the regular water pressure so it opens up and lets some water flow out through a pipe. In this case the water is simply bled off by opening an automatic valve whenever the pressure exceeds what it was set for. It does what it is supposed to do by preventing thermal expansion from building pressure in the system, but when they fail they usually just don’t turn back off. Running water is wasteful, runs up your water bill, and when unchecked can cause mold or mildew problems where it discharges. There are some toilet fill valves that also have this feature added and simply run the water off into your toilet tank and down the drain. They aren’t leaking like I described earlier, but are designed and intended to leak under higher pressure. They work in the exact same way and are just as wasteful. The white tank at the top is an expansion tank. An expansion tank allows you to temporarily absorb thermal expansion without wasting water which is why it is the solution we offer our customers. A small tank with a heavy rubber bladder inside is installed anywhere on the cold water side of your plumbing system. The bladder tank is filled with air through a standard bike tire valve to match your regular water pressure. 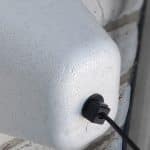 It is then installed to your piping with a threaded connection. As the water expands and begins exerting pressure across your entire plumbing system, it finds an easy place to stretch out and get comfortable in the expansion tank. The bladder is filled with air and acts just like a big balloon. The balloon easily compresses, giving the water the space it needs, and in turn prevents that water from pushing out against everything else. When you turn on the water or the pressure otherwise returns to normal through cooling, the balloon forces the water back into the piping. An expansion tank is a water containment device, while the other options are a water relief device. A relief device can fail and waste thousands of gallons of water before being noticed. Replacing them often involves cutting into your piping and making repairs. Once your plumbing is set up to accept an expansion tank future replacement is very easy. The rubber bladders do wear out and eventual will rupture inside the tank and will require occasional replacement, although they typically last for years. Maintaining proper pressure with a PRV and expansion tank should be considered preventative maintenance and are a truly necessary expense for all homeowners.